Nice find! I definitely like the dynamic pose on the Autarch-Lord. Kind of makes him feel like a Striking Scorpion themed construct, which is super cool! Can't wait to see him painted ! Making your country proud there, Magenb! The paint jobs, basing and the Wraithlord posing are just simply magic, bloke. Hats off! Yeah, moved the flamers to the head so it would look like the Autarch wearing Mandi-blasters I was thinking about some wings but I don't think they add anything to the charging pose. Hey Mage, just checking in. Any update on your Deepkin at all? Have you played anymore games or acquired some new models? I haven't really done much more with them. I did go in a 2k point friendly tournament as the store was a bit hard up for numbers, so it was a thrown together list, which shouldn't have mattered in a friendly tourney. Against Storm Cast, it was a fairly even game and rather enjoyable, every other game it wasn't worth the time to put the models on the table. I watched a few other games being playing, I'm kind of disappointed as I thought AoS would be better balanced than 40k, but its just as bad. 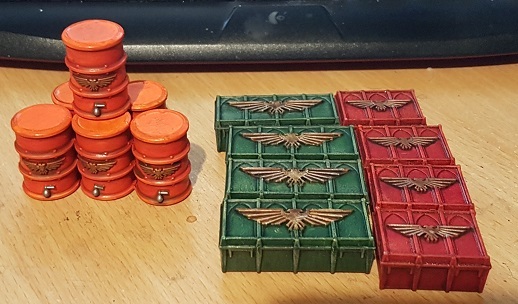 Since the current gen of GW's games aren't that fun, we've been focusing on 5th ed 40k, it seems to need the least amount of mods to keep things balanced, we've even started to convert some of the newer units and armies back into the rule set. Just had a game on Sunday Admech vs Sister, close game but my admech lost, too many darn flamers lol. Hobby wise, I've been trying to get my Admech up to table standard, nothing to write home about, as its alot of redcloaks and silver bodies at the moment lol. Some progress has been made on the new wraithlord, base coat, first layer of the gems, cloth bits are done and I've worked out where I'm going to put 3 of them lol. Sounds good, Mage, and sorry to hear about the Aos Tournament. Competitive play never changes does it . I'm also trying to get my two AoS armies up to standard. Should have the last reinforcements on the way to complete my Deepkin and my stormwater at 2000 points! With some options that I can interchange should I need to. Great update, Mage, those Tyranids are sick! Good job getting the Leviathan (or Kraken?) color scheme down. Looks great. You know, I've always wondered if Mistweaver Saih is an Idoneth? She seems like she would be, but I guess she might belong to another faction? Either way, really cool character! Loving that Ranger from Blackstone as well . Munitions and barrels are a thumbs up from me! Love the bugs magenb! And the crates ‘n’ barrels too! 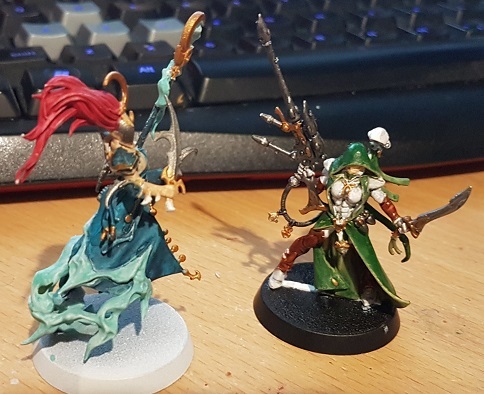 I'm a big fan of both the Mistweaver model and the new Ranger looking forward to the finished articles! I absolutely love those poses for the genestealers. Kudos to you for getting creative. I especially like the one that's popping out of the ground. Keep 'em coming. Sadily I can't take credit for the poses, they are all models from the Space Hulk kit. 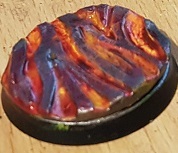 Bases didn't work out for what I was shooting for, but found a way to do marble lol. Sweet, those Brimstone Horrors look amazing, Mage. You always find innovative ways to do basing, you're an inspiration for some of my ideas for basing . I think the marble looks cool. Those guys look great! Color transition is spot on. Only thing I might add is maybe a bit of bright white at the bottom of them or a pale yellow, of coarse that's my hotrod flames. But beautiful none the less. testing out eyes... they can literally follow your opponent lol. what would you put on a molten base... something with a flaming sword or course, quick pose to see how it looks, lots of work on the BL still to go. Love the base, looks groovy and with a BL on top, perfect. The little horror, well just cool. Cool trick with those molten steel bases. They look great! Also cannot wait to see that Bloodletter finished, already looks ready for the table.